Microsoft has issued “Patch Tuesday” for June 2012. Total seven security bulletins are released. These seven bulletins address security issues in Windows, Internet Explorer, and the .NET Framework. Three of these seven bulletins are rated critical, the highest possible rating by Microsoft. The remaining four bulletins are rated as important. Important: Users should update their system as soon as possible since a critical IE vulnerability which Microsoft has patched in this month’s Patch Tuesday is under active exploit. 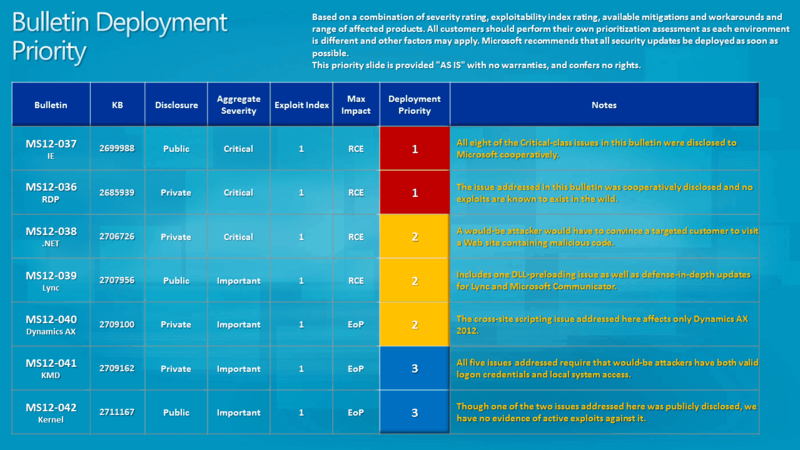 Below is a quick overview of June 2012 security bulletins issued by Microsoft. This security update resolves one privately reported vulnerability in Microsoft .NET Framework. The vulnerability could allow remote code execution on a client system if a user views a specially crafted webpage using a web browser that can run XAML Browser Applications (XBAPs). Users whose accounts are configured to have fewer user rights on the system could be less affected than users who run with administrative user rights. The vulnerability could also be used by Windows .NET applications to bypass Code Access Security (CAS) restrictions. This security update resolves one privately reported vulnerability in Microsoft Dynamics AX Enterprise Portal. The vulnerability could allow elevation of privilege if a user clicks a specially crafted URL or visits a specially crafted website. In an email attack scenario, an attacker could exploit the vulnerability by sending an email message that has the specially crafted URL to the user of the targeted Microsoft Dynamics AX Enterprise Portal site and by convincing the user to click the specially crafted URL. The Bulletin Deployment Priorities image (click here for full size) below suggests how the security bulletins should be deployed on affected systems. The Severity and Exploitability Index graph (click here for full size) below represents the risk and the impact of each bulletin. If your Windows is set to automatically download and update patches, most probably you system is already patched. If you have set it to manually download updates, you should open Windows Update and patch your system. You may have to click on the “check for updates” button to retrieve latest updates. If you want to download the updates for updating all your systems, you should visit the Microsoft Download Center. The June 2012 security ISO image will be made available soon at the Microsoft Download Center soon. The official summary page of the bulletins can be found here. You can also visit the Microsoft Security Response Center official blog for more details.